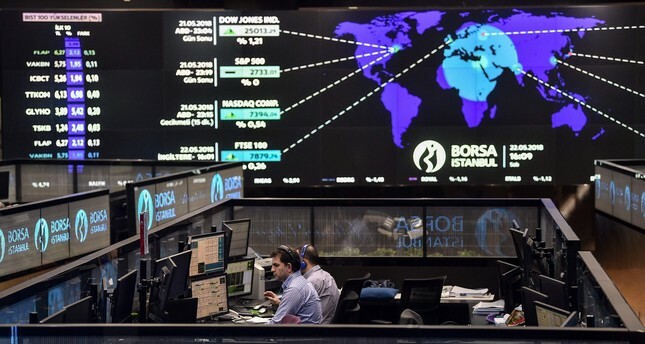 Traders working at their desks in the open office of the Borsa İstanbul, May 22. Following the official switch to the presidential system, all eyes have now turned to the budget talks that are expected to take place in September. There is a tough schedule ahead for President Recep Tayyip Erdoğan and economy experts, who aim to more effectively control the market, especially by managing the administration and its strategy in the economic field from a single center. The Undersecretariat of Treasury, which managed to maintain its central government budget performance in 2018, appears to be facing a more challenging year in 2019 due to increased costs and parity risks. On the topic of central government revenues, what sort of policy the treasury, which has filled its vaults thanks to the tax amnesty, will follow on financing costs is one of the leading questions arousing everyone's interest. I believe this institution, which has increased the auction of Turkish lira-based treasury bills in domestic borrowing, will focus on government bonds in 2019 and gradually reduce government bonds issued in foreign currencies. When we recall the statements in the 2018-2020 vision document of the Undersecretariat of Treasury, it was stipulated that loans are made predominantly in Turkish lira, the share of bonds whose interest rates will be renewed in the next 12 months is decreased by setting a fixed rate of interest on Turkish lira loans over the life of the debt instrument, and a strong cash reserve was needed to reduce the risk of liquidity in cash and debt management. Even if we assume that there is a strong relationship between the strategy of the central bank and the undersecretariat, we realize that the decisions taken in the last six months are aimed at protecting the lira and keeping interest rates as low as possible. Despite the recent increase in interest rates at the 500 base level, the fact that this decision has been delayed as much as possible should not go unnoticed. Now let's take a look at what this means for us, especially what sort of strategies and financial policy applications we should expect after this September period. On the public finance and treasury management front, economy management whose main strategy has notably been centered on transparency and diversification seems to be more proactive in the issuance of Turkish lira-based bonds and rent certificates when compared to previous years. Likewise, there is also a tendency toward using the incentive system in these areas in order to speed up the development of the insurance sector and the private pension system. It is highly possible that a new financial area will be born out of the partnerships between state banks, the treasury and economy management, which have been working hard on diversifying financing instruments and expanding the investor base. Nevertheless, the measures taken to gradually reduce the external credit volume and lower the credit risk arising from other foreign exchange transactions will, of course, cause declines in growth rates.Since the private sector is more fragile in this regard despite the positive state of public finance within current risks, the interest rate corridor decisions of the central bank will be carefully followed by the market in 2019. Especially on the issue of the treasury debt portfolio's sensitivity toward foreign exchange, interests and liquidity risks, I do not think that economists who are currently implementing a protectionist policy for 2018 will compromise on this in 2019 either. In this respect, companies that are acting without restraint while managing their cash and foreign exchange inflows and taking steps without lowering their borrowing ratios need to keep up with austerity policies in 2019. The fact that U.S. liquidity outflows clustered in the Asia-Pacific region instead of emerging economies caused problems in protecting the cash flow and interest balance of the treasury. In response to these measures, there are signals that a new construct is in line for insurance, reinsurance and pension products and great energy will be expended on transferring liquidity referred to as under-the-mattress savings into the system to prevent the market from shrinking. In 2013, the Individual Participation Capital (BKS) system was adopted to improve early-stage companies' access to finance. Within this context, the legislative infrastructure of funds designed as an alternative financing instrument is about to be completed. As of 2019, we are likely to encounter a new structure and new financing options.Both the debt of local governments and the debt stocks within the ministry of the treasury have been reduced gradually and their vulnerability to risks have also been significantly diminished. Therefore, investors' tendency toward medium and long-term borrowing instruments rather than short-term positions may lead to cost-effectiveness in return. Especially when we look at recent auctions, the average for loan maturity has been extended to higher levels, and borrowing costs have fallen when compared to previous periods. On the other hand, it should not be forgotten that a similar budget structure will continue to be implemented in a period when the ratio of central government interest expenditures to the gross domestic product (GDP) and the ratio of central government interest expenditures to tax revenues have been decreasing. • Loans will continue to be predominantly realized with Turkish lira-denominated instruments and fixed interest rates, and the average maturity of the debt stock will be extended in the long term to the extent market conditions permit. • Seeing partial increases in taxes for the sake of maintaining the budget balance amid increased energy and commodity costs is very likely. • In order to avoid serious deviations in growth figures, cuts in government investments, in particular, are not expected. The share of government spending on public-private partnerships for strategic investments and the reduction of imports is expected to increase. There are great expectations for investments from abroad in these areas in Turkey for 2019. Establishing partnerships with these companies, entering into the build-operate-transfer style projects are the main factors helping to maintain the sustainability of profitability. • It is possible that the Undersecretariat of Treasury will reduce foreign exchange movements in stock/bond issue items to the minimum to protect the value of the Turkish lira. It will be necessary for the banking system to be more sensitive to foreign currency-denominated debt in this period, and investors will need to review their investment feasibility while considering these risk policies. • Cash reserves, which hold an important place among the assets of the Treasury, are kept in Turkish lira and foreign currency accounts at the Central Bank of the Republic of Turkey (CBRT). It is possible that the economy administration will take tough measures to protect this level. At a time when financing costs are starting to rise, the treasury management will naturally try to increase tax and non-tax cash inflows. Likewise, potential income items such as the sale of 2b-status lands and paid military service exemptions will greatly strengthen the budget in 2019. In 2019, an increase of 20-25 percent is expected in tax revenues. Expectations of a budget deficit in the central government budget are extremely low. Therefore, it is assumed that the public will act more relaxed than before when it comes to domestic government bonds, and interest expenses are also expected to be reduced. Considering that both treasuries and central banks all over the world are cautious, those who are expecting profits from money markets should review their plans once again. The private sector needs to determine its own cash flow strategy in light of all this information and maintain its financing needs at the right levels. Avoiding unnecessary investments in the narrow interest rate corridor and this cycle of tight liquidity stemming from the Federal Reserve, turning toward the sustainable industry as well as research and developments investments are some of the key concepts of 2019.